Holly and I were in Los Angeles a week ago, visiting family and friends. In a lot of respects, the car was surprisingly normal to drive. The gasoline engine runs only when it needs to, so there’s a “READY” indicator that shows up on the dashboard when the car is prepared to move. Toyota’s engineers have put a lot of thought into making the thing behave like a conventional (gas-powered) car where it’s possible to do so. For example: if you take your foot off of the brake but don’t depress the accelerator, the car will begin to slowly move forward–just like an ordinary car. But it’s the electric motor doing the work at this point, so this is an entirely artificial behavior. It’s kind of hard to imagine it doing something else, but it leaves me wondering if this will be the norm many years from now, when (presumably) propulsion systems based entirely on a conventional engine are rare. Most of the battery charging energy comes from regenerative braking. If I took my foot off of the accelerator at speed, the car would gradually slow down, charging the battery in the process. Most of the car’s braking action also comes from using the kinetic energy of the car to charge the battery packs; friction braking is a backup used at low speeds and for more-aggressive deceleration. There’s a status display that shows (almost in real time) the flow of energy within the car. It’s a little confusing at first, but after you figure it out, it’s possible to see what energy source (gasoline engine, motor, or both) is being used to propel the car. When energy is being delivered to the battery (whether from regenerative braking or the engine itself), you can see that too. 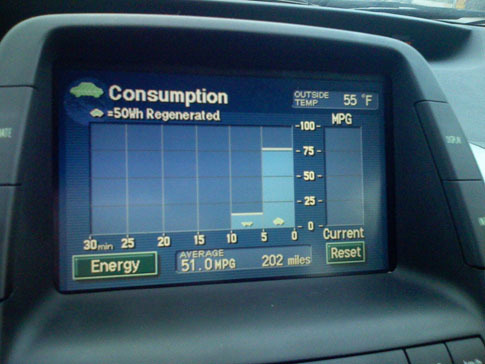 Another display (pictured above) shows you fuel economy in five-minute increments for the last half-hour of the current drive. I think this could really have an effect on one’s driving habits, as it’s so easy to correlate what you’re doing with how much fuel you’re consuming. I wonder how much less gasoline people would use if every car were equipped with this capability. After observing the display for a while, it’s clear how a great deal of energy being wasted in stop-and-go driving in a conventional vehicle. Every time you accelerate, the energy required to get the mass of the vehicle up to speed is consumed. Every time you brake (with a conventional braking system), the kinetic energy of the car is converted into heat. Battery technology and power generation isn’t 100% efficient, of course. But it definitely beats the 0% efficiency of braking in a conventional vehicle. Low-end acceleration was quite good; the car can accelerate briskly so long as it’s not moving very fast to begin with. Highways speeds are another matter; if you’re used to standing on the accelerator to blast around someone in a passing maneuver, you’re going to be disappointed. The electric motor doesn’t do much good at these speeds, and the gasoline engine…well, it delivers 76 horsepower. I took the photo above when I stopped to refuel before returning the car to the airport. Without really trying very hard, I was able to average over 50 miles per gallon for the 200+ miles I drove. Refueling cost sixteen bucks at $3.27 per gallon; it was hard not to feel at least a little smug.